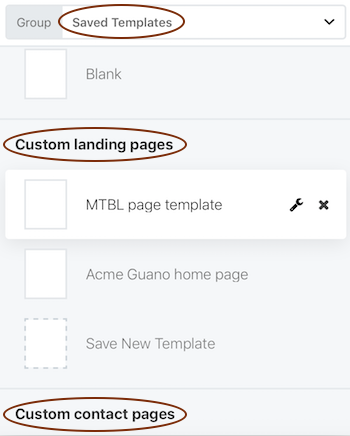 OK, you've created some custom layout templates, perhaps assigned them categories and an order, and now they appear in a separate tab or group under the built-in layout templates. Review the basics about custom layout templates. Now suppose you want to hide the built-in Beaver Builder layout templates and display only your own. Using the procedure below, the Saved templates group displays by default, with your custom layout templates displayed according to any categories you've assigned, as shown in the screenshot below. In the WordPress admin panel, click Settings > Beaver Builder and then click the Templates tab. In the Enable templates section, select Enable user templates only. Tip: If you have the Agency version of Beaver Builder, you'll see an Override core templates checkbox on this screen. This is related to white labeling the custom templates to remove the Edit and Delete links from the display. For more information, see the Related Articles.